I wouldn't hesitate to frame a sponge. I love it! They help u remember which sponge to use for what - seems obvious but never seen it done before! Oh that is adorable! I would absolutely frame it. The website says they naturally decompose after 24 weeks and I'd hate to lose it! LOL! I'm assuming that only happens if you get it wet and use it. I agree, it's too cute to dirty. Put that sponge in a frame! It would be cute in a frame with an easel so you can sit it near the sink. Hey I spotted your fabric! :) I wouldn't want to use it either! Just frame it! While I haven't framed a sponge, I have framed kitchen towels... anything is possible!!! you can always find the coolest stuff in Japan. that really is fantastic! deserves to be framed. Sure it is, Jess; just ask Squidward. I love cleaning supplies and good design. Therefore...sponge framer! Too cute... a good excuse for not doing dishes! I definitely will frame it. Too pretty!! so fun! i love fun surprise mail! I just opened up a "favorite things" swap on my blog. I'd love you and other How About Orange Readers to participate! Wow. Now that is a sponge. I love it! I'd definitely frame it!! Oh so pretty! I'd definitely avoid using it too. I love it! It is very cool!You definitely must frame the sponge! I can't stop to wonder how it is made...it is silk screening probably? I've never seen an artfully-made sponge! How neat is this! A sponge that's signed - sure I'd hang it up! that confirms it - let's all move to Japan! 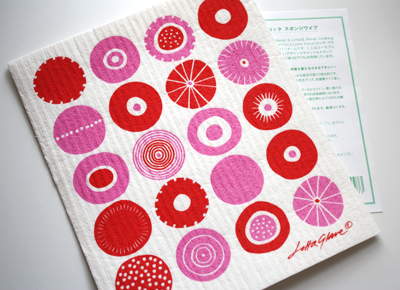 I just ordered some Marimekko sponges like that! I don't think I'll want to use them, but I just had to have them.